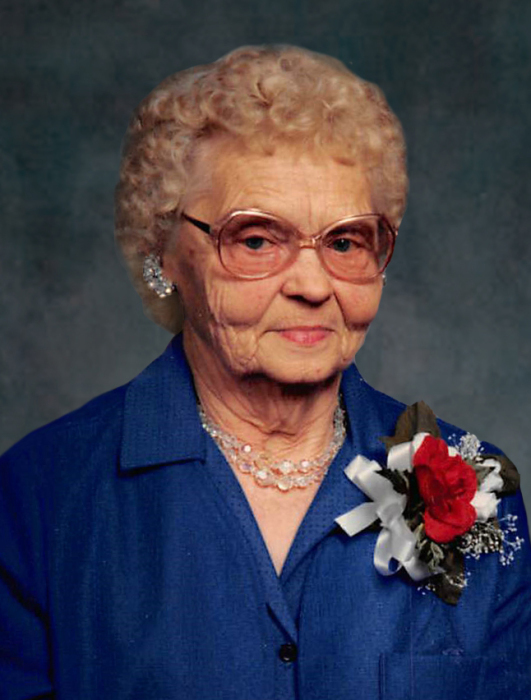 Leona E. Arneson, 99, Lake Park, MN died Tuesday, March 19 at Sunnyside Care Center, Lake Park. Funeral Services for Leona will be held Saturday, March 23 at 11AM in Lake Eunice Evangelical Free Church, rural Detroit Lakes, MN. Visitation will be held one hour prior to services. Leona Eleanora Johnson was born July 31, 1919 in Lake Eunice Township near Detroit Lakes, MN to Nels and Agnes (Johnson) Johnson. She was a graduate of District 99, a rural country school in the Lake Eunice area. As a young lady she worked for Pettibone Lodge in Shoreham Village near Detroit Lakes. On July 17, 1937 she married the love of her life, Maynard “Mike” Arneson. Leona and Mike welcomed two daughters to their family: Lois and Sharon. Leona worked hard her entire life raising her family all the while helping operations on the farm, from milking the cattle, taking care of the chickens to driving heavy machinery. Leona was an extraordinary lady, willing to do what it took to make sure her family was well cared for. She was a wonderful cook and baker, known for her lefsa. She enjoyed tending to her garden raising raspberries and was talented in embroidery. In the fall Leona canned the produce made by her garden and would often share it with family and friends. Leona centered her life around her family and her church. She was devoted wife, mother and grandmother who will be deeply missed. Leona is survived by her daughter, Sharon, five grandchildren: Leanna (Bruce) Lunde of Lake Park, MN, John (Brenda) Seley of Lake Park, MN, Gary (Linda) Bergh of Rogers, AR and Tom (Gina) Bergh of Audubon, MN. She is also survived by many great-grandchildren and several great-great grandchildren. She is preceded in death by her parents, one daughter Lois and her husband Henry, one grandson Mike and his wife Kevin Bergh and son-in-law, George Seley.